Below is just a quick illustration of what I am talking about. Dr. Pepper – I remember seeing tall bottles with this logo as a kid. Makes me think of playing golf for $3.00 a round at Gus Wotham Golf Course in Houston. 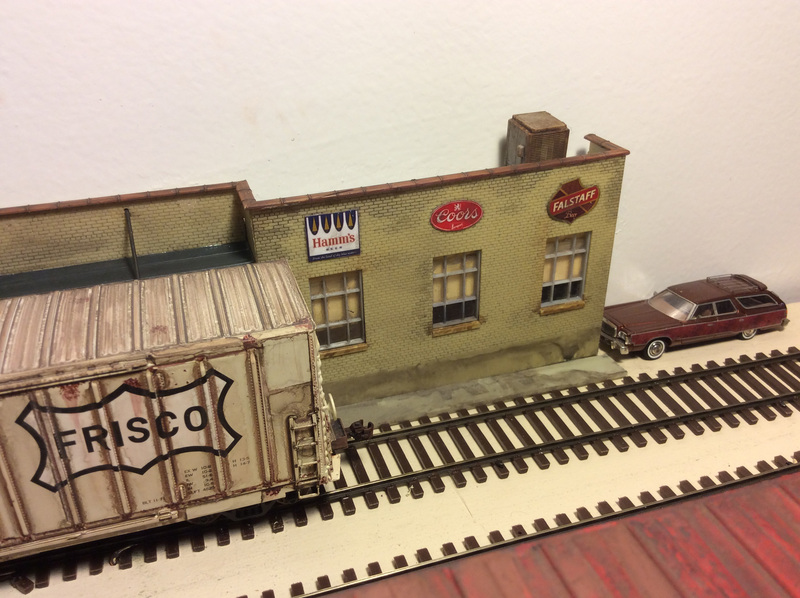 Tracks to nowhere – I remember seeing a lot of lonely branch lines all over Texas and Arkansas that I wondered if they were still in business. Sure enough, there was eventually a small business that still saw some rail activity. The late-1970-early 1080s still offered a lot of opportunities to explore lonesome, yet still active rail lines. The Rock! — I remember seeing a lot of Rock Island action as a kid. 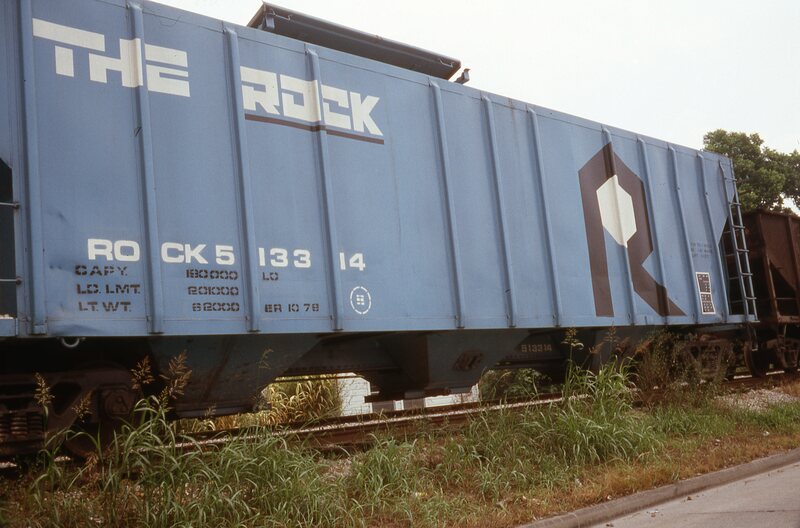 I caught the above on a Burlington Northern train near Houston, TX in May of 1980. 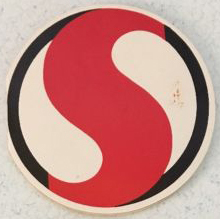 This is such an icon for me, that like B. Smith, I have adopted a dual era layout–1979 (Rock still active) and 1981 (Post BN-Frisco merger). You’d be surprised how many cars and locomotives must exit or enter the stage based on two years. Been spending a lot of quality time with my Railway Equipment Registers! Grocery Store Warehouses — Here is an icon that may appear on B. Smith’s LCN. 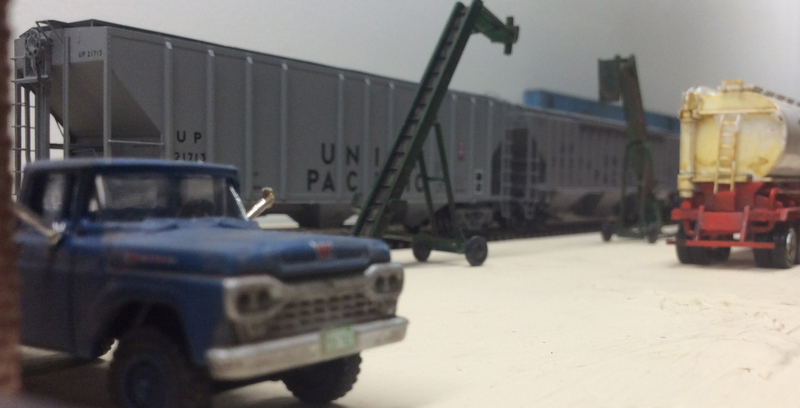 Grocery store warehouses receiving rail shipments screams out an earlier day in railroading. Falstaff Beer – This is really an icon for all the former great brewery traditions or brands across our land. I know a lot of great new beer traditions have merged, but I still miss some of the iconic brands like Falstaff and Hamms. 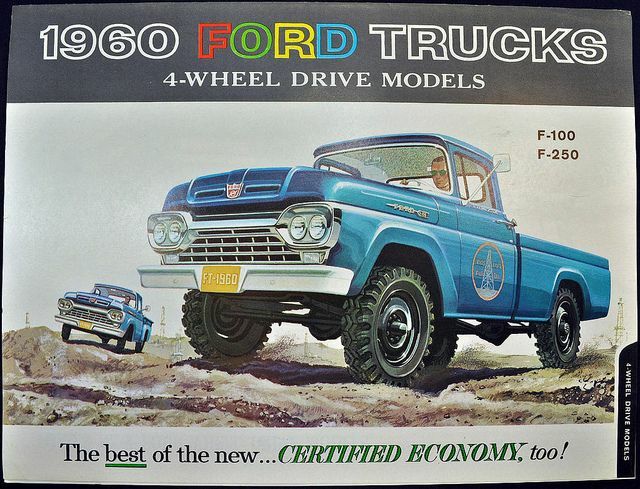 Old pickups and cars — These are some of my favorite icons. Vehicles have the potential to create a time aura like nothing else.
. 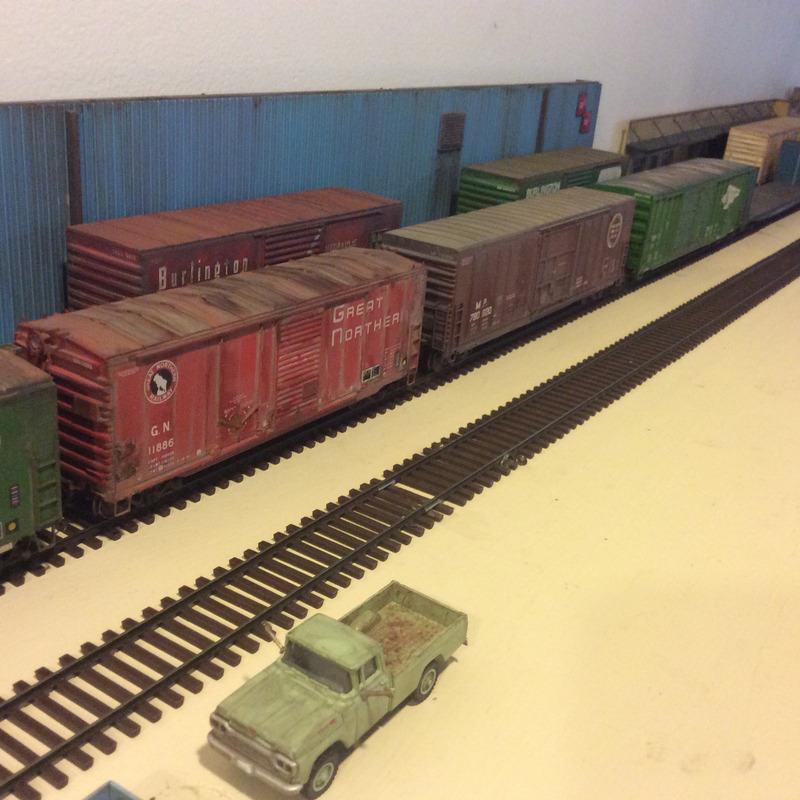 Scene on the Rails West layout. What if you really want an icon that is very difficult to achieve? No kits, no available art work, etc. That is when it really gets fun. 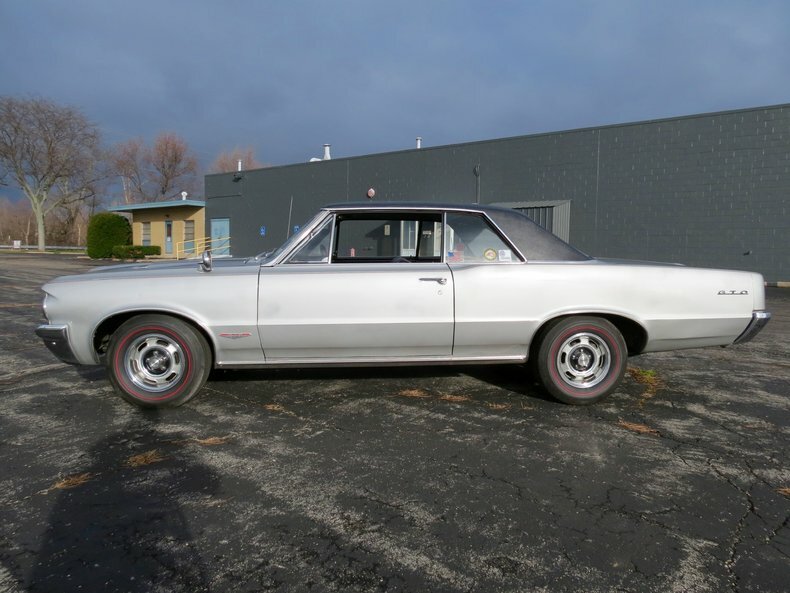 And that finally, brings us to the main topic of this post…the 1964 Pontiac GTO! Now that’s an icon! Considered by many to be the first muscle car, meaning high performance and low-cost, the GTO became available in 1964 as an option to the Tempest LeMans. The GTO featured distinctive appearance items in place of standard LeMans features. The famous Gran Turismo Omologata (GTO), better known as ‘The Goat,’ ‘The Tiger,’ and ‘The Great One’ was for the first year offered to the public. The GTO became a much greater success than Pontiac ever thought possible. Here’s a slick video on this iconic car. Good question. I have been able to get my hands on a set of Williams Bros GTOs! We will see what happens. Here’s a link to Williams Brothers kits. They are clear plastic. I don’t know if they are still available. The link was last updated April 17, 2000! It is going to be a challenge for sure. I have about three or four projects ahead of them, so it is going to be a while. The Rails West layout NEEDS a couple of these. We’ll see what happens. Stay tuned. 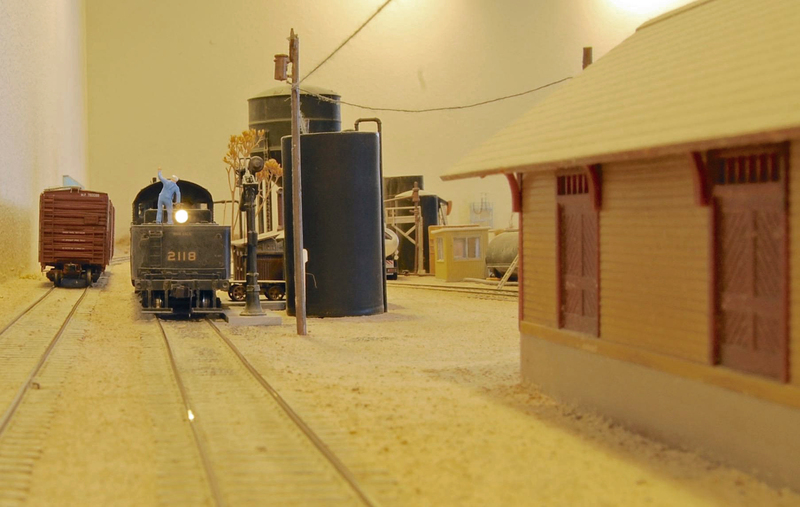 In Part I, we two came into Sanderson in the late afternoon with box cars for Big Bend Wool and Mohair and two empty open top hoppers for scoria loading. After little a little action, we took on water. About to couple into the load. Grabbing the two empty hoppers on the main. 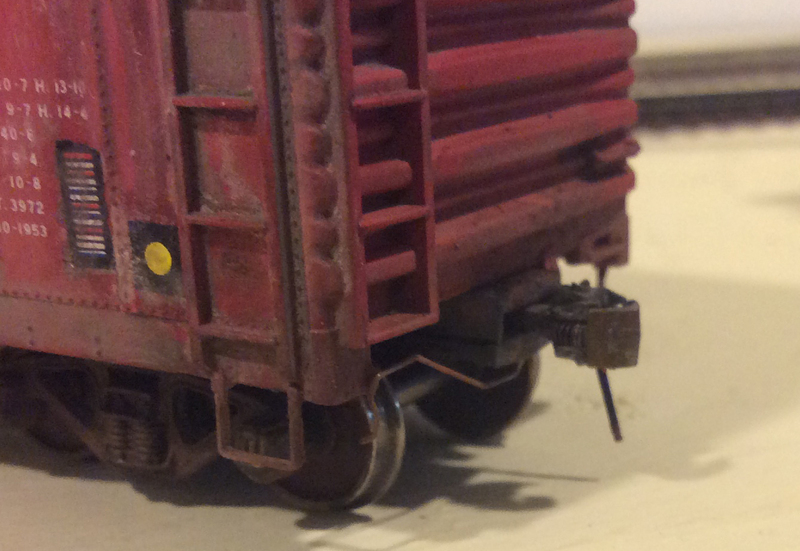 And putting them on the scoria siding so they can be rolled down for loading. Backing down the main to get the caboose after leaving the load on the scoria track to be picked up tomorrow. Looks like the ACI label has just been applied to the hopper. The crew shakes their heads at this new-fangled electronic system and say it will never work. 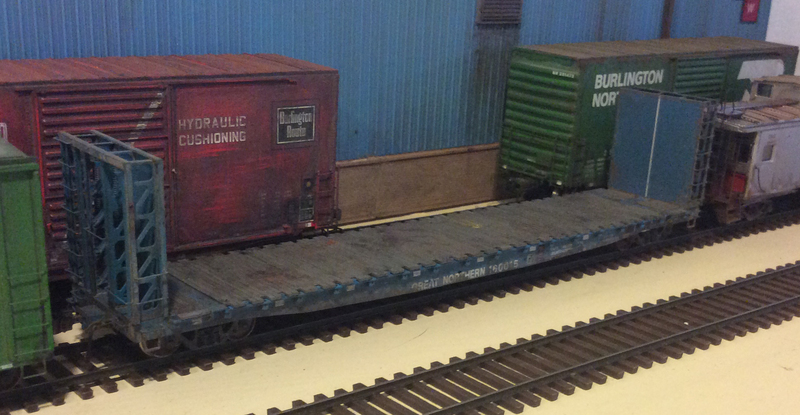 With caboose in tow the locomotive trundles down to the east end to spot the two loads at Big Bend Wool and Mohair. 1968 in West Texas and Big Bend Wool and Mohair is getting in lots of bagged feed in by rail. Above is a scene from 1977 that helped inspire the above operation. The locomotive and caboose tie up at the water plug and the crew call it a day. 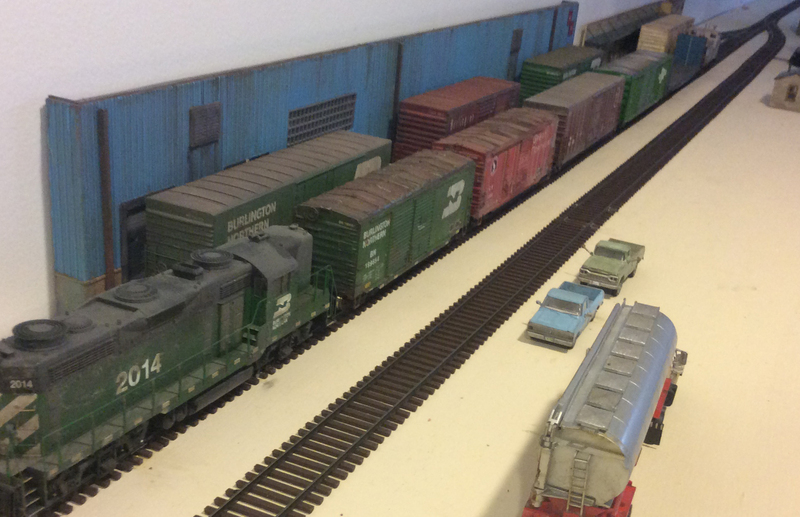 The crew cuts off the caboose and two empty hoppers. 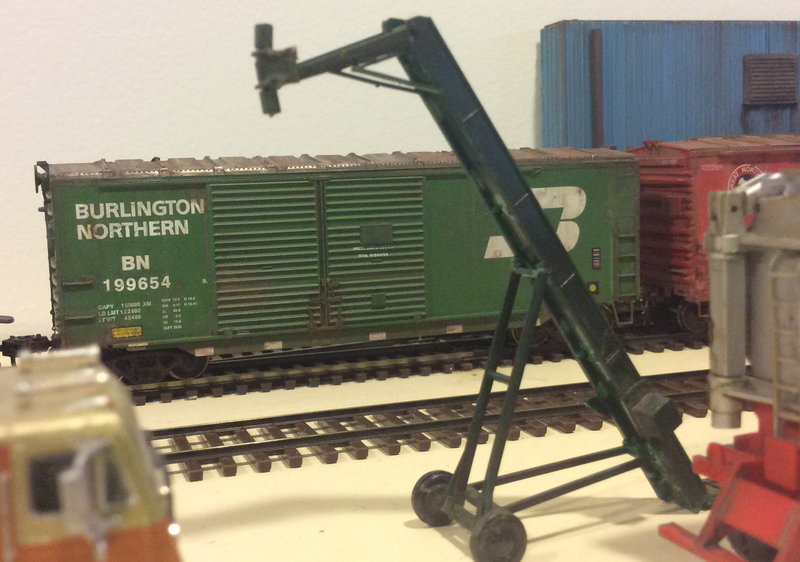 The LCN is having problems getting open hoppers from the class ones and operates an eclectic assortment of second-hand hoppers to serve the scoria shipper. The empty hopper when the train departed earlier in the day has been loaded. The two loads for Big Bend Wool and Mohair are run to the east end and cut off on the main. 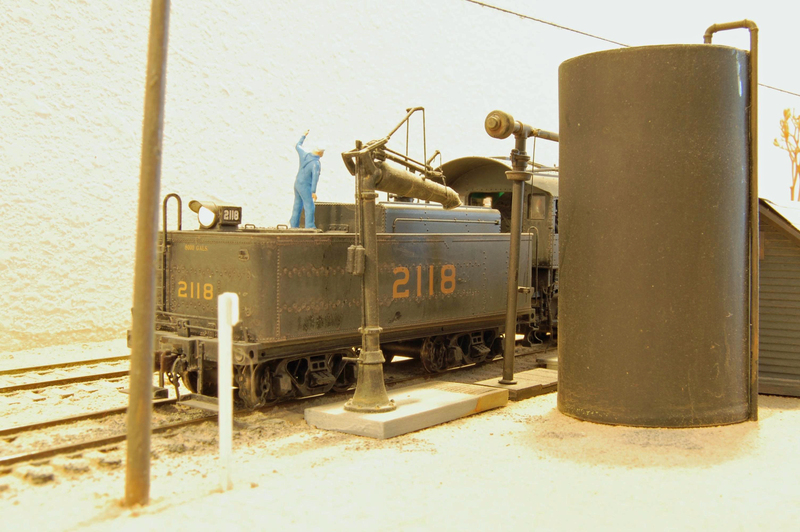 The locomotive then backs to the water plug to fill its tender. After filling the tender the locomotive backs down the siding to the loaded hopper after the brakeman flags it across a crossing. In Part II, we’ll complete the run and tie down for the evening. I love buildings like this. Not easy to model, but what character! Here you can see where the tracks used to service the structure. Unfortunately, Rancher’s Supply appears quite closed. 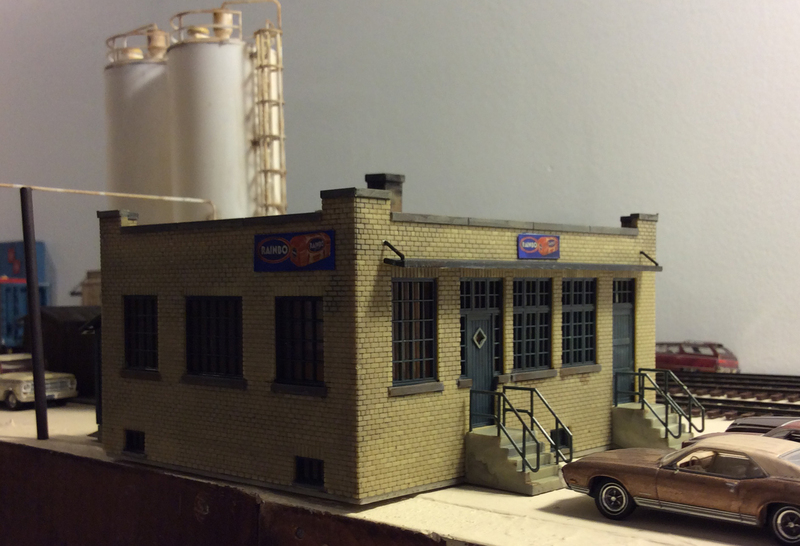 However, for you more modern modelers, next door is a modern gem. Note the orange and white building next door to the right? It is Roswell Wool. It is still a going concern. Sadly the BNSF no longer a has an active spur to it, but you can see where it once ran and the doors that were possibly used to load boxcars at one point. Hard to know how long Roswell Wool has been at this location. Right down the track to the north are a lot of warehouses that were at one time used for shipping agricultural traffic as well. 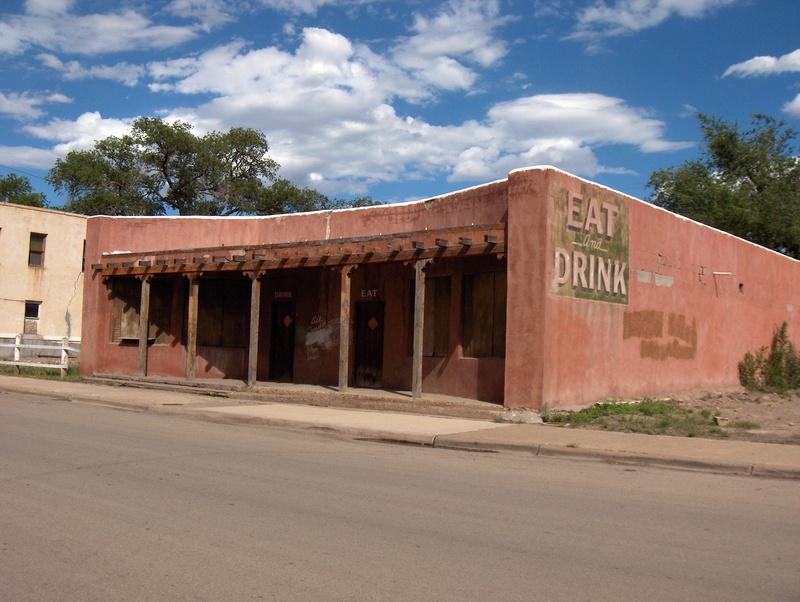 Like many western towns of any size, Roswell is full of building crying out to be modeled. Oh well, that may be a subject for a future post. The local came into town pretty light today. As is often the case, the yard crew in Trinidad did an iffy job of blocking. 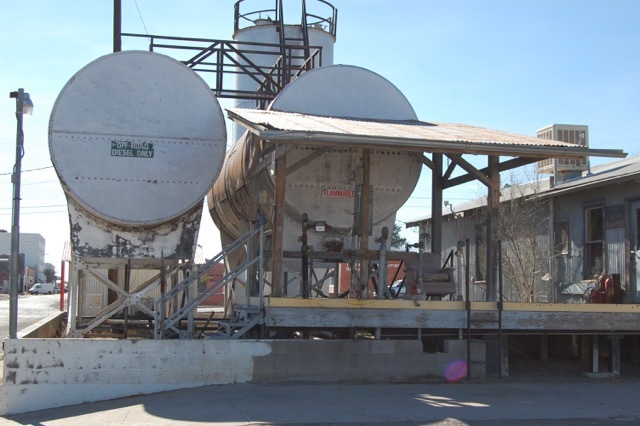 Three empties for the C&C RR interchange and two loads for Carrizo Springs. A couple of recent Rails West projects are featured. 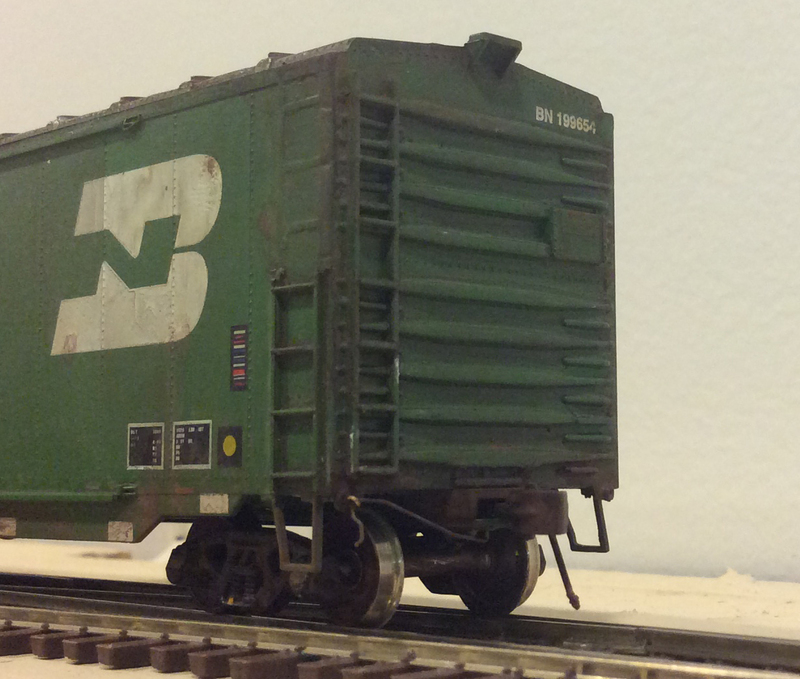 A re-worked Accurail kit to depict a GN double-door boxcar. 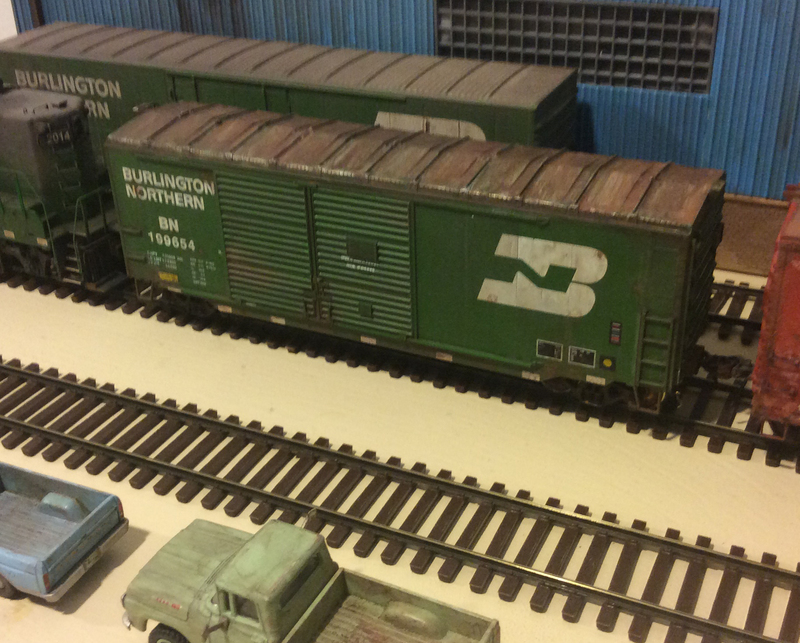 I weathered it, cut the ladders down, removed the roofwalk, added lube plate, wheel inspection and ACI decals, replaced trucks, installed grab irons, stirrups, scale wheels and pin lifters and brake hoses. It was about a 3-month project with many, many breaks. All in all, I’m pretty happy with it. Not perfect, end ladders clunky, but it is close enough. 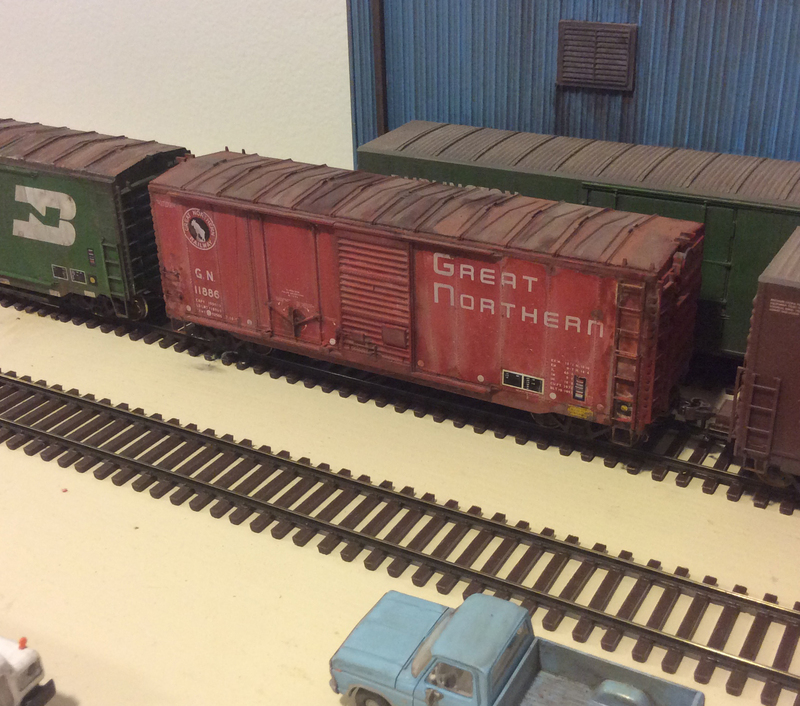 I also re-worked an Athearn BN 40 footer. 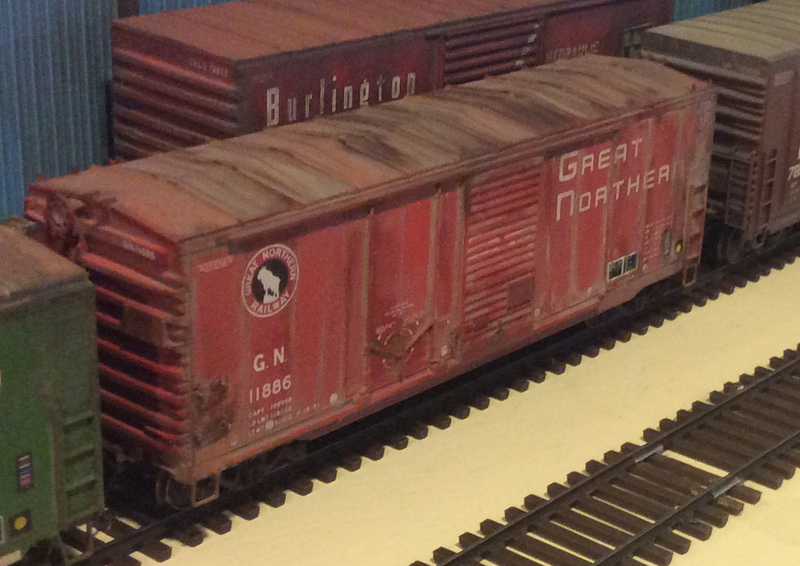 I did most of what I did to the GN boxcar, but I did not replace the grab irons. Again, close enough. I wanted a couple of double door 40 footers to serve as backups when no 50 footers were available for the sawmill on the C&C RR. 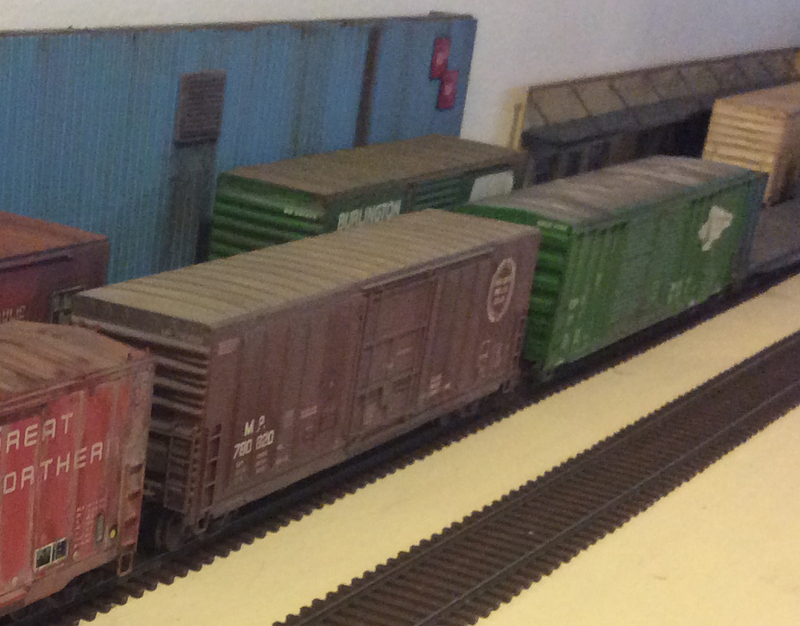 They will be rare visitors, but I like the idea of having a few 40-foot boxcars still on the layout. Again, a bit clunky in a few places, but overall acceptable. Weathering hides a lot! Forty footers are fading icons from the rail scene in my era, the late-1970s and early 1980s. The two work pretty well together. We might as well check out the rest of the small consist. Here’s an empty for loading at the sawmill too. Here is a load of beer for Hernandez Distributing and the CPLT box is a load of plywood for Foxworth Lumber (team track in town). 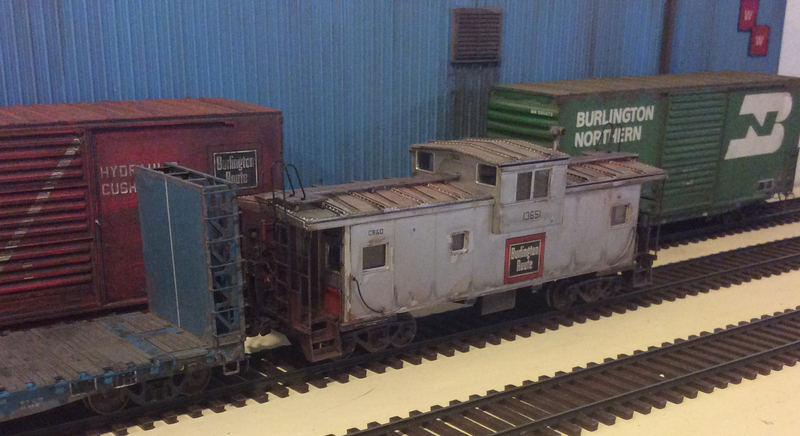 And lastly, the venerable CB&Q caboose that frequently makes the trip over from Trinidad. 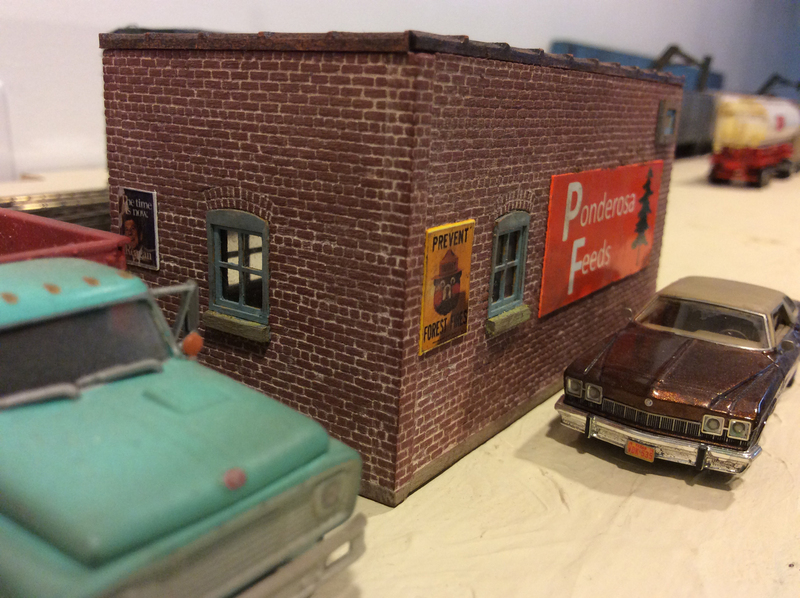 The crew will make their set outs and grab a bite at Paul’s Mexican Food. They’ll grab the empties from Western Warehousing and the empty Frisco box from Hernandez Distributing and beat it back to Trinidad hoping to beat the 12-hour clock. 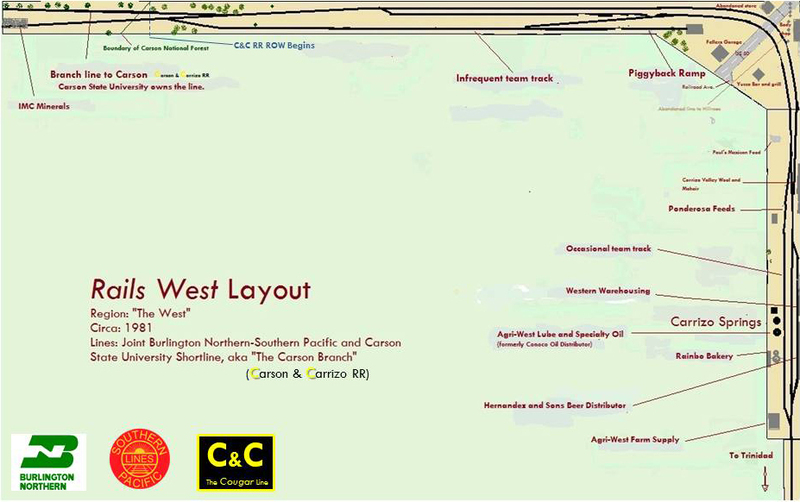 In Parts I and II of this series, I shared overall maps and described my structures in place or planned for the east side of Carrizo Springs, the primary town of the layout. 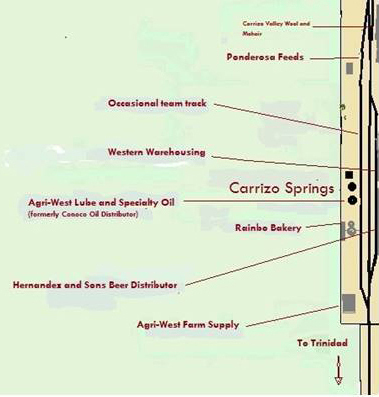 In this post, we’ll explore the west side and outskirts of Carrizo Springs. Going from east to west (towards the interchange with the Carson & Carrizo RR), I’ll discuss each structure. 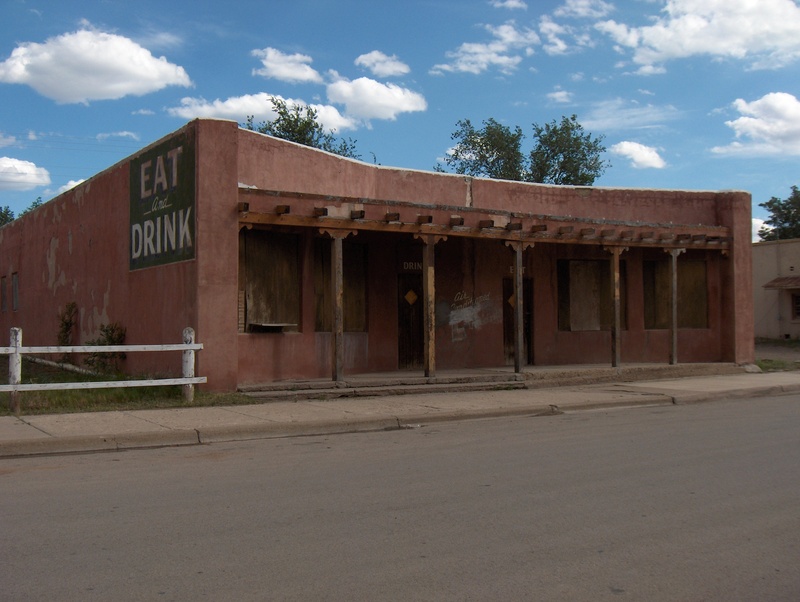 This structure is undetermined, but I can share a picture of the inspiration in Carrizozo, NM. 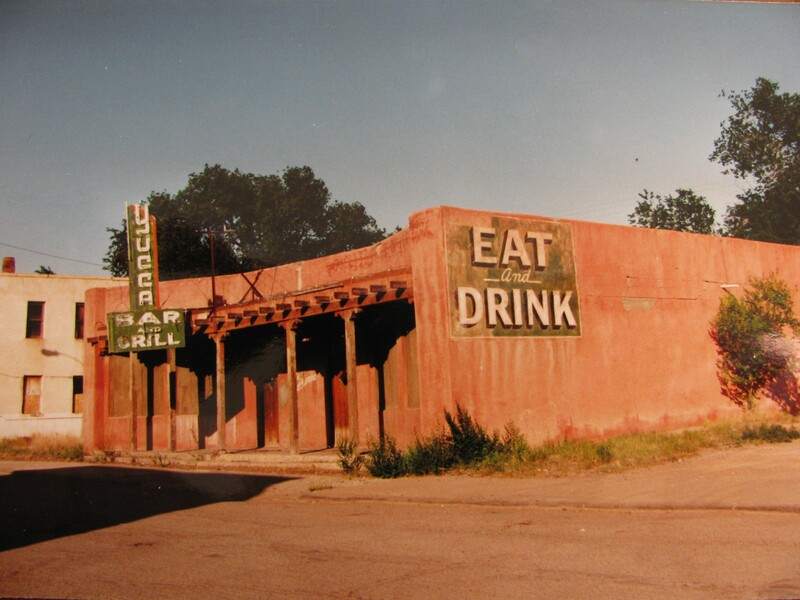 This restaurant in the early 1990s had the best red enchiladas and green chili cheese burgers. It was old school all the way and some of the customers really wore spurs! It was magnificent in my eyes. Note the cool swamp cooler out the side of the structure. Little touches like that give your structure a real regional identity and help create a more authentic sense of place. Above is how the place looked in the early 1990s. Note iconic sign still there! This photo and the next two were taken around 2007. We’ll see if I model it, but I know I should try. 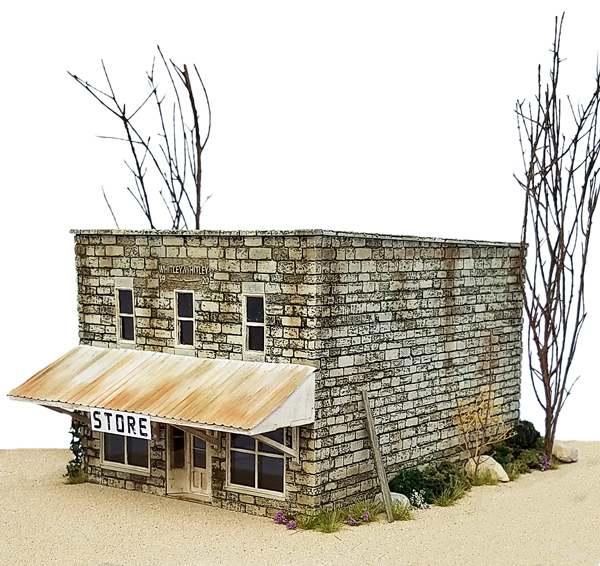 The next three are a little easier and almost guaranteed to be quite good because they are Monster Model Works kits by one of my favorite craftsmen kit producers, Jimmy Simmons. His kits are AWESOME and yield very good results. I know it is a little cookie cutter on the last three, but why not embrace excellence and take it easy sometimes? 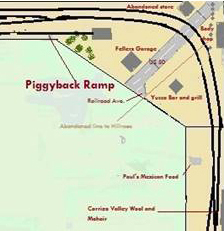 The infrastructure at the piggyback ramp will be minimal, just a ramp, a couple of trailers and a few tumbleweeds. 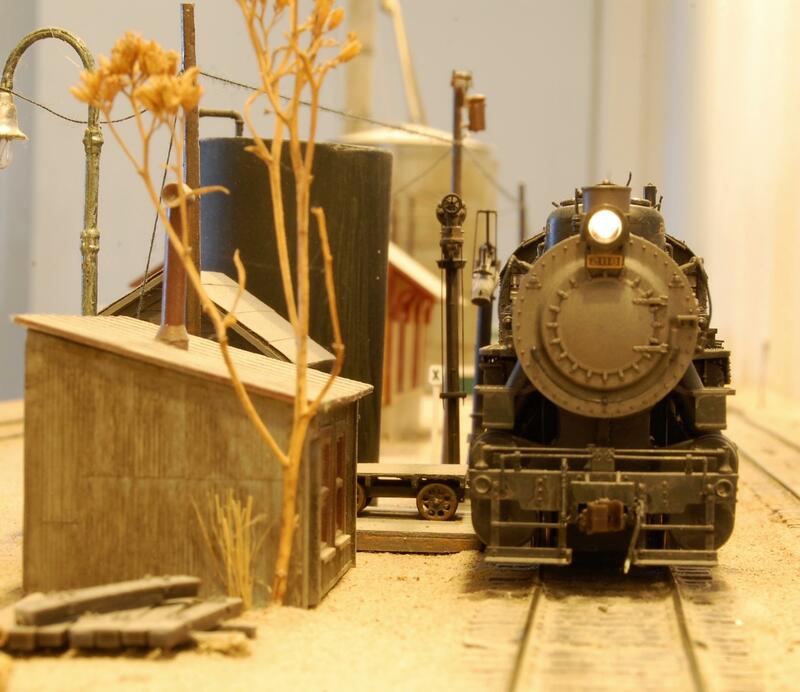 At the far western end of the layout, there won’t be much. My goal is to subtly suggest a change in ecotype as the country begins a transition into the foothills of the Carson Mountains. 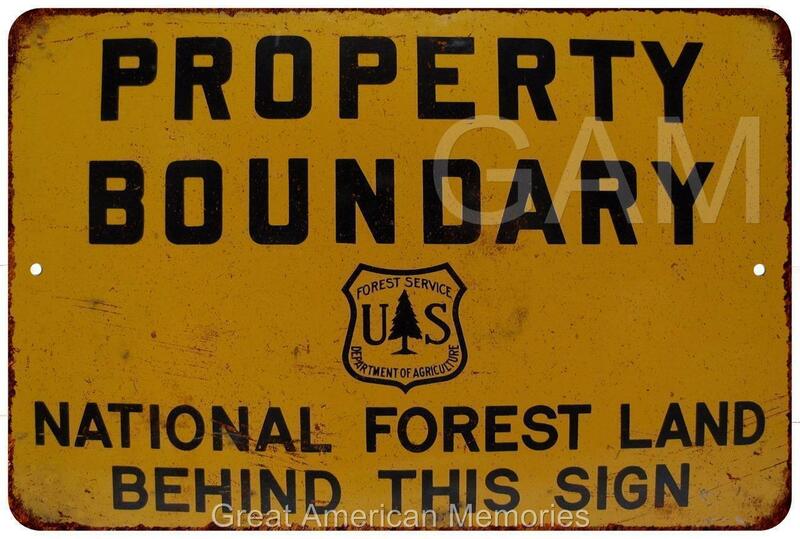 A few trees will begin to appear and signage may indicate the boundary of the National Forest. The IMC mine is still under conceptualization right now. 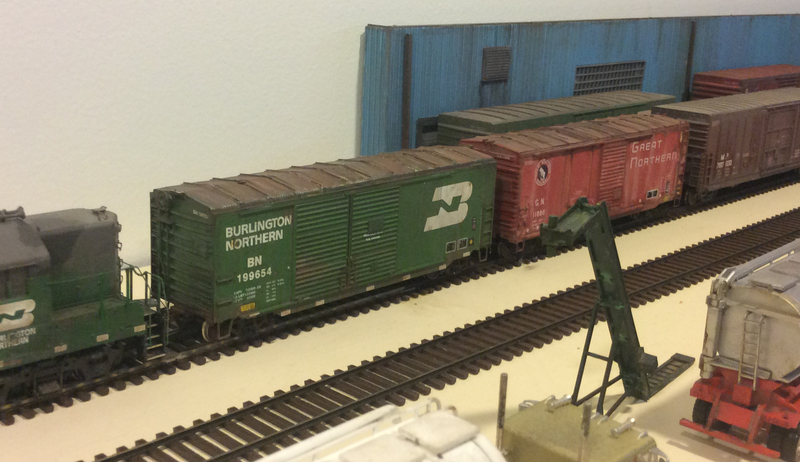 There you have it on the current and future Rails West layout. I gotta go, I have a lot of work to do! In this post, I’ll share some details on structures and planned structures. As a refresher, the modeled area is shown again below. OK, let’s drill down into the east side of Carrizo Springs. 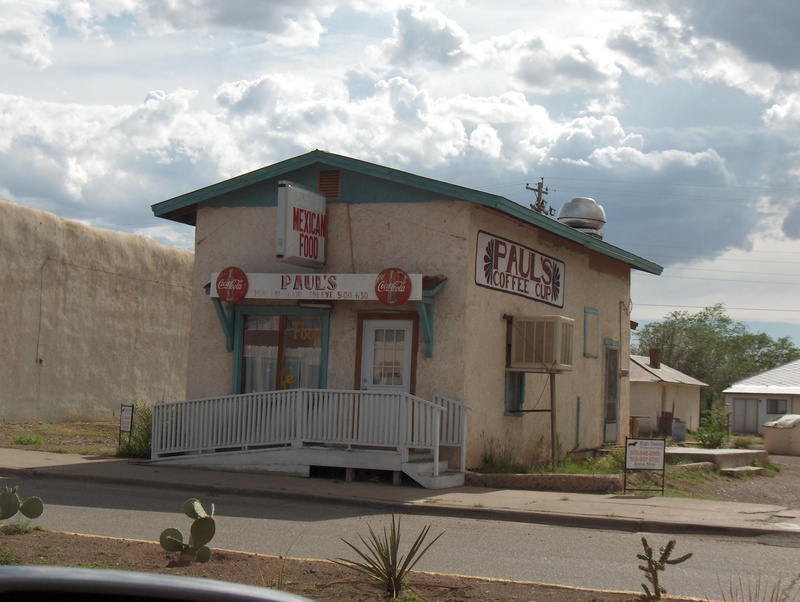 This will be based on a variety of influences, but mostly a combination of former dealers in Marfa, TX along a former SP main line. (now UP). Likely the subject of a post in the near future. 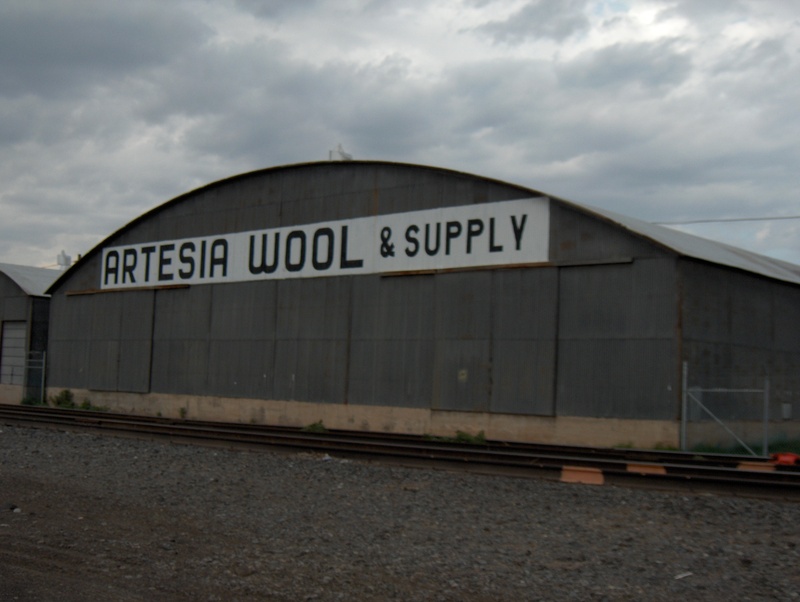 For a post on an active wool and mohair shipper in Alpine, TX in the late-1970s, click here. 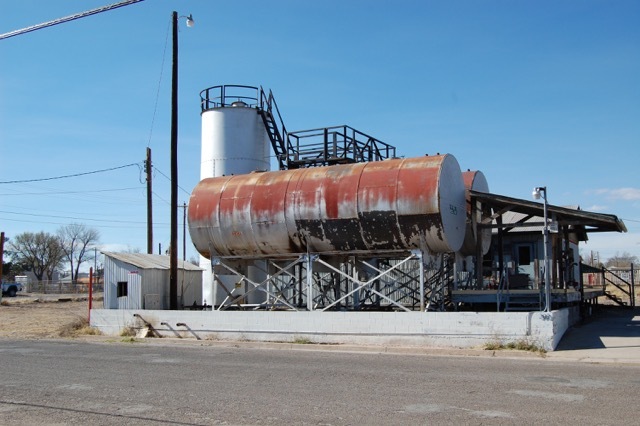 This non-rail serviced structure will be based on multiple influences of a few structures in Texas. 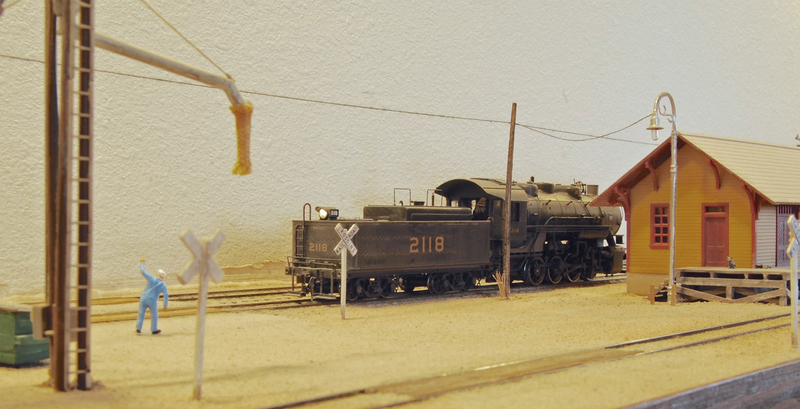 In the next post, we’ll venture towards the western end of the layout.